In attempts to develop culinary processes, I often complicate things. A pause can often clarify the problem. I had an urge for noodles recently and also remembered seeing some silly device at Target and couldn't stop thinking about both of them. The device at Target was a 5 wheel roller that was supposed to mince herbs. The only thing I could hope to share with Bourdain is my fondness for a Chef's knife, its versatility made this herb shredder useless. BUT, maybe it'd be a slick noodle cutter. I rolled about 250 grams of pasta dough (made from 135 g of a mixture of unbleached white, rye, wheat and spelt flours plus salt, 1.5 eggs, trace of olive oil and let the kneaded dough rest a day in the fridge). I split the dough in 3 golf ball size lumps, rolled it out kind of thin and tried this silly multi roll cutter. I thought I'd fly through these noodles being able to make 5 cuts instead of 1 with my trust pizza cutter. Wasn't sharp enough, tough to cut. Then I realized using the Pizza cutter would take about a minute to cut noodles for all of us and using the 5 wheel roller would, if it worked, shave a big 40 seconds off the exercise. Dumb. The pizza cutter reigns supreme in noodle cutting. Unless you're making noodles for a hundred tables, it's pretty adequate. Plus, you get the bonus that all the noodles are slightly different widths. Aesthetically superior, and clearly homemade. 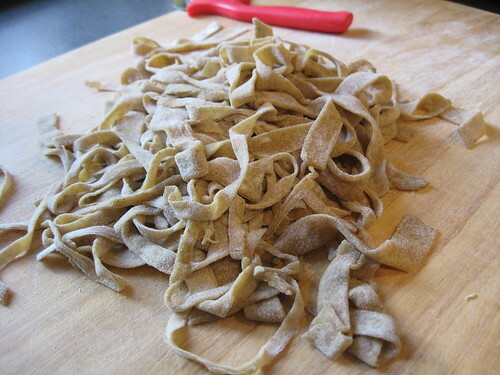 I have always used a pizza cutter to make noodles, and can't imagine doing it any other way. I was showing Mom how to do it the other day. She has always used a knife. I remember noodles from my childhood being unevenly thick and chewy in places because the knife bunched up the dough as it cut. Before I could even start to show her I had to take a steel to the edge of her pizza cutter to knock out all of the dents and waves in it. Great site by the way. Good luck with your perfect bread. Hey Mike, I agree, look much better than "professional" looking noodles. Anon, Thanks for the kind words.